Coming to Project Scorpio and PS4 Pro along with current gen consoles. Ubisoft has announced that Far Cry 5, the next game in the open world FPS franchise, will be releasing on February 27th 2018 for Xbox One, Project Scorpio, PS4, PS4 Pro and PC. 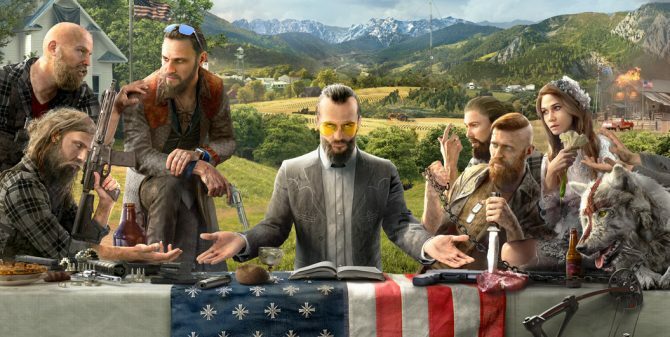 It takes place in Hope County, Montana and will feature both a single-player and co-op campaign. The story of Far Cry 5 sees the player joining as a junior deputy in the fictional county and dealing with a doomsday cult known as the Project at Eden’s Gate. Players will join hands with residents to form a resistance and battle against the cult in different locations. Along with gathering resources, players will have numerous vehicles to play with including muscle cars, ATVs and boats. Interestingly, there will also be planes for aerial dogfights. Weapons will include sledgehammers and baseball bats to the traditional guns. It’s also possible to hire mercenaries to fight with you or even Fangs for Hire like bears and cougars to assist. If that’s not enough, the map editor will also be returning, thus allowing fans to create their own battlegrounds. Check out the reveal trailer below to see how the game looks.